This project has brought together a number of previously dispersed but related state government agencies in a singular work space. The new space combines staff offices, meeting rooms, staff facilities and an art gallery within an adapted ex-retail shop front. This has enabled the creation of a visual street presence for the client and for the artists, whose work they support and promote. 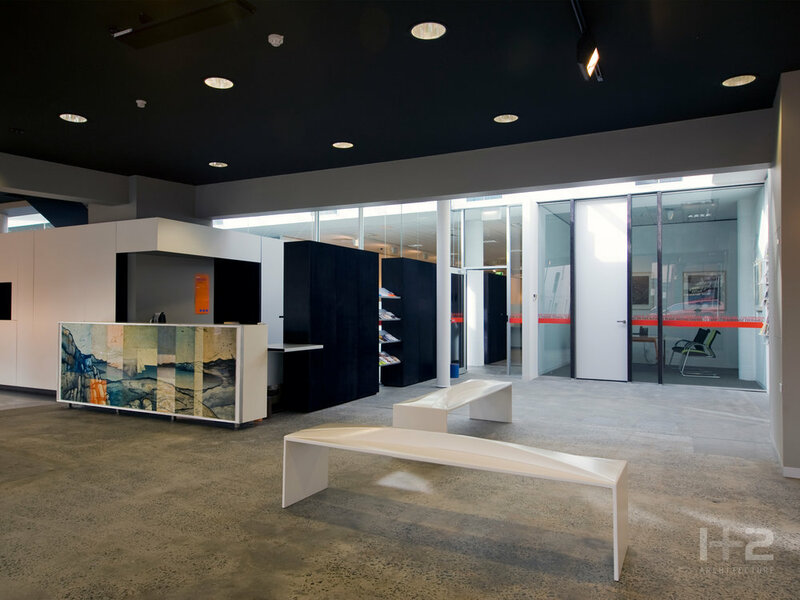 The new architecture endeavours to blur the boundary between gallery and office spaces. The gallery walls permeate the office space bringing colour and light, while creating an ever changing and inspiring visual interior. A core intention of the project was to strengthen connections between the department and the public generally. A primary mechanism for this has been the creation of the shop front gallery. The project is located within the controversial ‘Bridges Brothers’ site redevelopment (a separate project completed by others about 3 prior). In occupying this space, the new elements attempts to interpret and negotiate the layered heritage fabric of the site, including what remained of the Bridges Brothers mid-20th Century adaptation and the 19th Century terraces which form the bulk of the Elizabeth Street frontage. Ways employed to do this, included the retention and restoration of the remaining ground floor shopfront and a strategy of colour coding remaining structural elements as they were revealed in the interior. The integration of visual art works and furniture from the department collection and art specifically commissioned through the Art in Public Buildings Scheme (APBS), was important to the client and a feature of this initial briefing. As architects, we had an involvement in the selection and briefing process for artists. An early opportunity identified by the project was the possibility of a light based installation for the poorly lit back wall of the space and submissions were sought through the APBS process for artists working with light. Jude Abel’s submission was selected and successfully installed, achieving a delightful interaction between the architectural and artistic endeavours of the project. "What a lovely surprise, you enter Arts Tasmania’s principal centre through the very portals previous generations of shoppers have entered – for very different reasons. Then the sloping picture windows reflected children gazing through at desired toys; or sportsmen contemplating fly rods and exotic lures. Now the visitor is enticed by art – entering a light and airy space, the roving eye caught by the gallery of art works and installations. 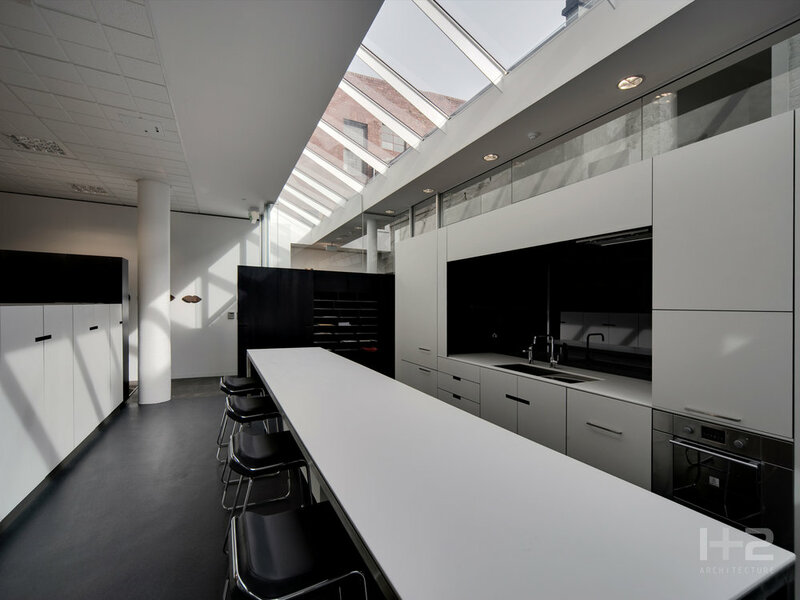 This is clever use of space, appropriately negotiating the layered heritage fabric of the site, from the light-infused kitchen and lunch area to the light installation which illuminates the otherwise dull end of the building. Work stations are inviting; indicative of creativity. This is a heritage building once shaded and utilitarian which has been subtly transformed into a centre reflective of artistic creativity."